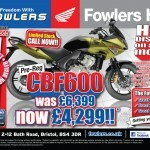 This entry was posted in Offers, Press Advertising on 26/07/2013 by Fowlers News. Pedal Power Returns to Fowlers! 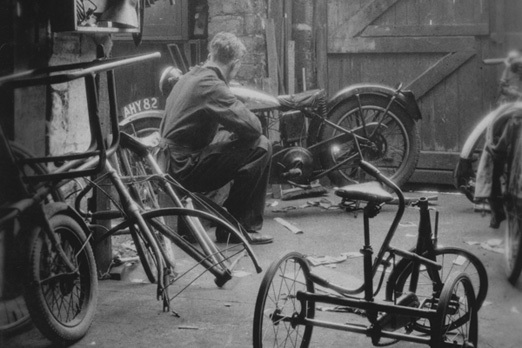 “Bristol’s biggest and longest-established motorcycle dealer is returning to its roots, opening a new cycling store within its 40,000 square foot showroom close to Temple Meads. 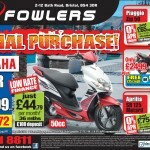 Originally established in 1926 as a cycle and pram shop by husband and wife team Frank and Alice Fowler, Fowlers has evolved into one of the UK’s largest motorcycle dealers, selling new bikes from Triumph, Aprilia, Honda, KTM, Moto Guzzi, Suzuki and Yamaha as well as a range of scooters, including Vespas. 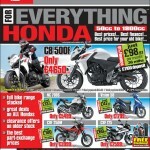 This entry was posted in New Bikes on 26/07/2013 by Fowlers News. 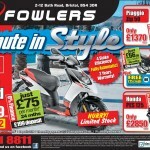 A stylish and affordable new scooter in the 125cc segment. 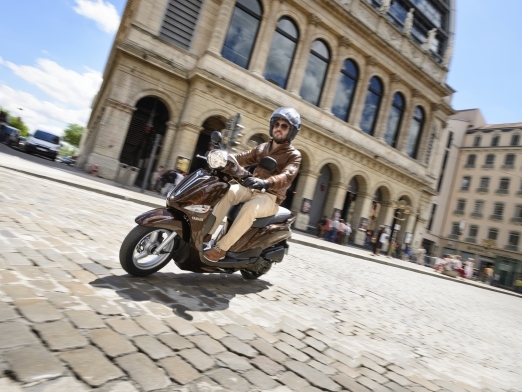 Yamaha is one of the Europe’s leading scooter brands, and the company currently offers one of the widest and most exciting model line ups from 50cc right up to 530cc, including the EC-03 electric commuter model. The range is constantly evolving and changing with the arrival of new and uprated scooters such as the latest Aerox R and X-MAX 400 models, and there are over 30 models and variants in the current line up. Our absolute commitment to two wheels, combined with an all-consuming desire to bring innovative and exciting designs to the street, has made the Yamaha brand one of the most respected names in the industry. 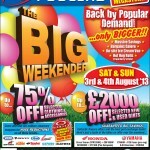 Join us at Fowlers for another BIG WEEKENDER! 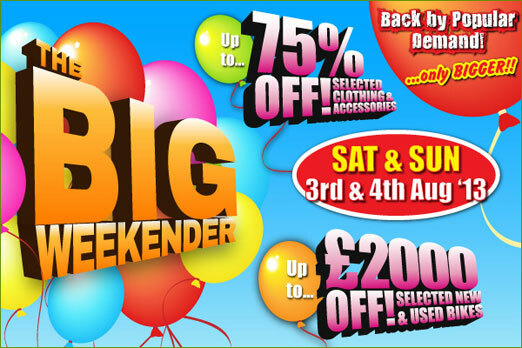 On Saturday & Sunday, 3rd & 4th August 2013 our clearance marquees are back by popular demand with more sensational savings! 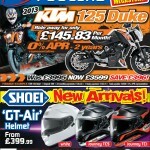 This time you’ll find no fewer than 5 clearance marquees jam packed with bargains of up to 75% OFF selected items! 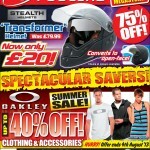 All your favourite brands will be featured including: Oakley, Shoei, Alpinestars, Arai, Weise, Rev-it, Monster, KTM, Spyke, Duchinni, Oxford plus many more. 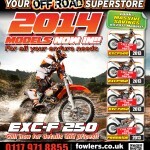 This entry was posted in Events on 24/07/2013 by Fowlers News. 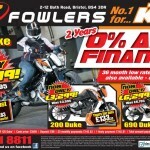 This entry was posted in Offers, Press Advertising on 18/07/2013 by Fowlers News. 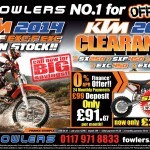 This entry was posted in Offers, Press Advertising on 11/07/2013 by Fowlers News. 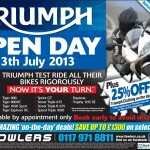 Follow Triumph on the Thankful Villages Run! The Thankful Villages Run is a nine-day charity ride-out to all 51 villages in the UK who had all their soldiers return home alive at the end of the Great War in 1918 and we want you to take part! The run, which takes place between 27th July and 4th August 2013, is the brainchild of motorcyclists Dougie Bancroft and Medwyn Parry and appropriately aims to raise £51,000 for the Royal British Legion. This entry was posted in Charity, Events on 05/07/2013 by Fowlers News.